This watercolor on ink sketch comes from a recent trip to the Monterey Bay Aquarium, a visual and learning treat. 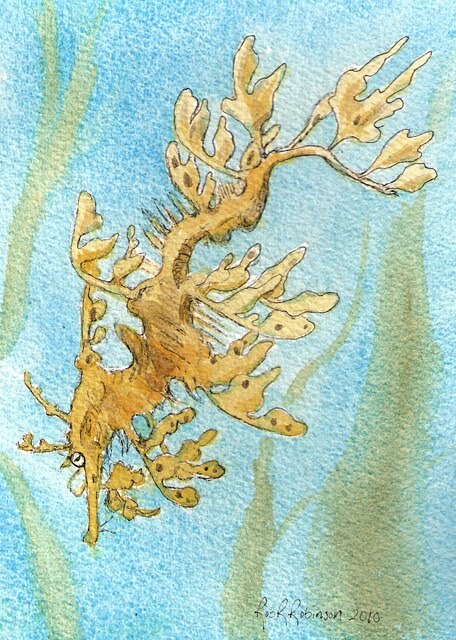 The Leafy Sea Dragon has amazing camouflage for living among marine plants. 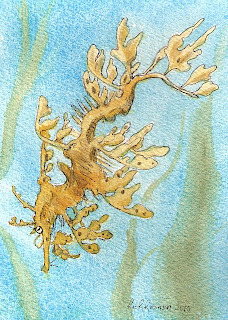 Take a look at the video on the Monterey Bay Aquarium site to see how the sea dragon moves and to see its relative, the Weedy Sea Dragon. They are so strange looking, but graceful to watch. Saw them at the Atlanta Aquarium a couple years ago. You did a nice job rendering the little guy. I missed them at the Atlanta Aquarium but have seen the sea dragons twice at Monterey Bay and also at the Oregon Coast Aquarium at Newport. That's another great place to visit - http://www.aquarium.org/.